Thought this would be perfect for a 25th (Silver) Anniversary card. I used the Silver Glimmer Paper that is in the Holiday Mini Catalog (catalog is only valid thru January 3rd). You could use it for a Valentine Card too. We have been busy making cards for the soldiers over seas in Afghanistan so that they will have these cards to send to family and friends towards the end of next month. I so appreciated my friends who are helping create these cards. We get together almost every week. It's been perfect that Stampin' Up! has so many heart/Valentine related items in the new Occasions Mini Catalog. Both of the above items will be available for purchase as of January 4, 2012. The Big Shot Die Cutting Machine is one of my favorite tools for card making, scrapbooking and paper crafting. It is so versatile and cuts thru a variety of products so easily. In the 2nd photo above, the embosslits give a beautiful embossed designed to each heart. Really nice texture to them. A simple Valentine using the Take It to Heart stamp set, item #125520 - Wood OR #125522 - Clear. The stamp set will be available for purchase on January 4, 2012. The stamp set has 4 heart designs and a banner desing. This set matches up with the Hearts Collection Framelits and our Full Heart Paper Punch. The tiny white hearts were made with a Stampin' Up! Small Heart Paper Punch, item #117193 which is in our main catalog and available now. The Small Heart Paper Punch is smaller than the stamp set small heart. Notice how the design is cut thru the front and then attached to the card inside. Leave it to Stampin' Up! and Sizzix to come up with an amazing combination .... Framelits Dies for the Big Shot with stamp sets made to fit perfectly. Remember when we could only cut out an image in a card "IF" the punch would would fit. Now with Framelits, you decide where the punch out image is to go. The only limitation is that the paper you are cutting has to fit thru the Big Shot. Did you notice the gorgeous pleated satin ribbon? It's a brand new product too and will be available in 4 colors. I have many fond memories of Christmas over the years, even dreaming of a white Christmas as a child. It was such fun when that dream would come true. Loved building snowmen and sledding. Living in AZ, where we live now, snow is not even a possibility unless we drive at least 2 hours away to the mountains/higher elevations. This Christmas my yellow rose brush has the most gorgeous yellow roses on it. I only have 1 rose brush, and I can see it from my kitchen window. We planted it in remembrance of my mom whose favorite flower was the yellow rose. It is very special to see it in full bloom today. My family is always in my heart. Will be spending the days with wonderful friends (our extended family) so the day will be special. Hope you will have a wonderful holiday too. I'm so excited that Stampin' Up! will be carrying two styles of Framelits Dies for the Big Shot in the new Occasions Mini. It even has a stamp set that is perfect match for it. The largest label is approximately 5 7/16" wide. Each collection includes 6 dies in a sturdy envelope for easy storage. These will be available to customers on January 4th, 2012. I used the Big Shot Embosslits Die - Beautiful Wings #118138 for the multi-color butterflies on this card. This die is available now. It's on page 216 of the main catalog (Stampin' Up! Idea Book & Catalog 2011/2012. I made this card for a friend's birthday next week. Lisa, Hal, and I worked together to make this birthday banner for Kassidy's birthday on Friday, the 9th. Hal cut out the white pennants while Lisa and I used the Big Shot die cutting machine to create the scallop circles and lettering. Lisa and I sponged the edge of the pennant pieces with Cherry Cobbler Classic Ink. I think it turned out really nice. Accents of glimmer paper and stitched felt for this card. The latest My Digital Studio (MDS) downloads are now available, click HERE. I like the Silver Glimmer Paper circles as the center of the snowflakes (stitched felt). Oh my gosh, do you believe that Christmas is just 5 days away!!! I think I will be ready. We are having friends over for dinner. Everyone will help by bringing something. I remember as a child going to my Aunt & Uncles home and there being 40 people there for dinner. What wonderful memories. Another Keep it Simple card. Many of these cards have already been mailed to my friends and family. They were so much fun to make. I enjoyed trying to come up with different looks using the same products. Just when I find a new favorite, another one steals my heart. I changed the look of this card by adding in a rectangle of Cherry Cobbler Card Stock under the rectangle of Very Vanilla Card Stock. Sponging the edges of the Very Vanilla allows the edges to stand out and makes the design "POP". Thought the Stitched Felt was the perfect addition to this card. 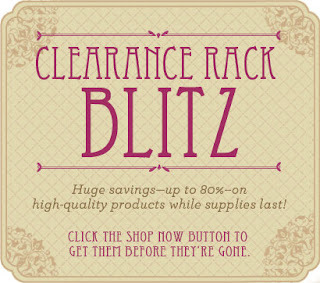 You don't want to miss this great clearance sale!!!!! 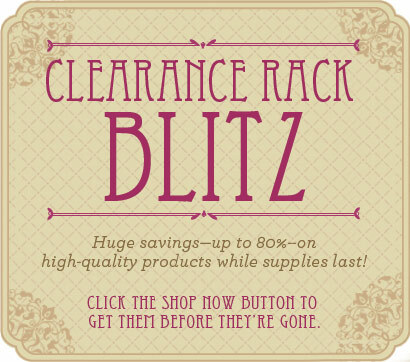 Clearance Rack Blitz items are only available while supplies last. There are no refunds or exchanges on Clearance Rack items unless the item is defective. You may order from my Stampin' Up! website 24/7 by CLICKING HERE, then click on Shop Now. There is a Clearance Rack section you can click on at the left of your screen. 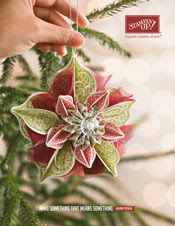 The Stitched Felt - Winter Wishes is in our Holiday Mini Catalog. They are perfect for cards, scrapbook pages, or to embellish a gift box or bag. So many things you can use them for. There are 16 pieces - 4 each of 4 designs (pair of mittens, snowflake, wreath, and holly). The card above has been sponged with Cherry Cobbler Classic Ink, item #119669. This card is very similar to the one I posted yesterday except that I added in sponged highlights and a paper punched border. When you sponged highlights you can do it lightly or dark. I actually sponged over the full front of the card and then heavily sponged the bottom edge. Keeping the design simple but elegant was my goal for this card. I used a Very Vanilla card stock base and then added in strip of Cherry Cobbler strips of card stock that had been accented with Cherry Cobbler ribbon. First, I want to let all of you know that my Stampin' Up! website is now back up and working. This affected thousands of demonstrators. Your patience and understanding was greatly appreciated. As you may have noticed many of the Christmas cards I am showing are made using the Hand-Penned Holiday Stamp Set. I want to show how you can use the same stamp set but have many different cards and looks. The Stitched Felt is one of my favorite aembellishments this holiday season. My Stampin' Up! website is still unaccessible this morning for many of my customers. Stampin' Up! is working hard to resolve this issue for their demonstrators. It has affected thousands of us. I apologize for any inconvenience this has caused any of you. I know this is a busy holiday shopping weekend for you. Also, if you would prefer, you may contact me to place the order for you. I can place it thru the demonstrator only website. The only thing I cannot order is the Clearance Rack items. They have to be ordered by the customer only thru the website (either link above). Another version of the card I posted yesterday. I just want to let you know that my Stampin' Up! website is temporarily down. Stampin' Up! is aware of the problem and is working hard to get it back up and running as quickly as possible. 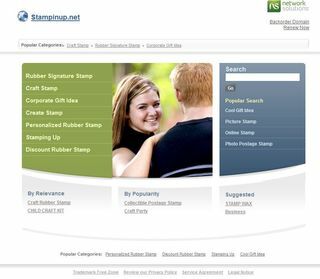 This situation has affected many Stampin' Up! Demonstrators and our customers. This is the first time in the 3 1/2 years I've been a Stampin' Up! Demonstrator that this has happened. This is a photo of the screen you will see while the system is being worked on by Stampin' Up! and Network Solutions. While this screen is active, customers are not able to order from my site. It is such a busy time of the year, it is unfortunate this has happened. But there is still a silver lining in this .... I can still place your order for you thru the demonstrator only website. All you need to do is contact me (via e-mail or phone) and I will be able to place the order for you. If you e-mail, please include your phone number and a good time to call you (don't forget to let me know what time zone you are in). Just a reminder too NOT to include any credit card information in the e-mail, I will get that from you once I talk to you. My e-mail link is on the top of this page. I can order whatever Stampin' Up! products you need with the exception of Clearance Items which can only be ordered by a customer through my Stampin' Up! website. Again, I apologize for any inconvenience this may have caused you. When I called Demonstrator Support, they said they felt the problem would be resolved today. As many of you know glimmer paper is one of my favorite products, the more sparkle the better. When you layer glimmer paper it is extremely important to put your glue dot, sticky tape or multi-purpose liquid glue on the back of one piece of glimmer paper then press it firmly on top of the other piece of glimmer paper. If you try to put the adhesive directly on the glitter it will not stick. I found my method works well. I bead up the liquid glue a bit so it will spread into the glitter below. Then set the item aside to dry. I use the multi-purpose liquid glue on the back of the felt to adhere it to the card. It is item #110755. Stampin' Up! 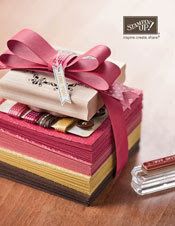 has a brand new Large Sizzlits Die called Paper Doily that will premiere in the Occasions Mini Catalog as of January 4. The cut out doily is approximately 4 1/4" in diameter. I can see many uses for this die. I used it on a card front - perfect fit for an A-2 card and then combined three together to create a paper doily to put under one of our Pocket Dragons (a collectible). There are three doily patterns put together. I love the intricate design. I used a paper piercer to poke out all the little pieces. Doesn't our little Pocket Dragon look great on this paper doily! Here's one on a card front. A touch of red glimmer paper to add a bit of sparkle and then a brand new Jewels - Large Pearl to add to the center. Here's another card that could be used for any occasion. Very versatile and easy to swap out the colors of your choice. I used dots of Dazzling Details to accent the card along with the ribbon. I feel that this card would work for so many different occasions. I often make up a few like this to have handy in case I need a last minute card for someone. The Paper Daisies can be used as white or sponge with any color you want. The package has 40 daisies: 10 ea of 4 sizes (approximate sizes are 3", 2 1/8", 1 1/4", and 5/8" All 4 sizes are shown on the card.) The daisies are easy to layer and accent with a brad or a button. Click HERE to watch Shelli Gardner on the Today Show. Stampin' Up! does a great deal for charity. I'm glad to be part of the team. Click HERE to see ALL of the My Digital Studio Downloads that have been offered. Buttons can make such a difference in the look of a card. The Designer Buttons - Holly Berry Bouquet are the perfect touch for a Christmas Card. There are 48 pieces total in the package: 12 ea of 2 designs in 2 colors (Real Red and Wild Wasabi). Think beyond Christmas and these buttons could be used for Valentine's Day and Saint Patrick's Day too. Very versatile. This rosette which measures 10 1/2 inches across was made using a brand new Stampin' Up! Bigz XL die called Designer Rosette. It will be available to customers in the Occasions Mini Catalog that premieres January 4th. I cut out 3 of these, attached them together using sticky strip. After hooking them together, you start applying pressure to get the rosette to lay flat. I used a hot glue gun to attach a large circle to the front and to the back. Apply pressure until dry. The Happy Hanukkah Card was 99% made using My Digital Studio software. The Menorah, pearls, ribbon and bows are all digital downloads. Like the card yesterday, I printed the design out on my color printer then attached it to card stock to create my card. When you are creating something like this, you can print just the background and the Menorah then actually add in actual pearls, ribbons, and bows rather than the digital images of them like I did above. This card was made 99% using My Digital Studio software from Stampin' Up!. I printed the image out on my Epson printer, then adhered it to a piece of card stock to create a Christmas card. The glitter brads, bows, and designs are all images from My Digital Studio. My Digital Studio would be an amazing gift. It is item #118108. Does it seem possible that the holidays are just a couple weeks away. December is always such a wonderful time of the year to spend time with friends and family. This year has been extremely busy, and December will be no exception. 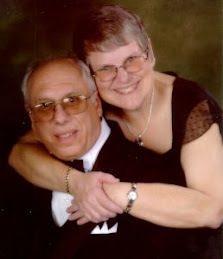 For the next couple of weeks (thru the 18th), I'm spending time with my wonderful husband. I will be checking e-mails so will stay on top of your orders. My blog has posts loaded for Monday thru Friday each week and if there is any breaking news I will be sure to let you know.